Makerspace – Page 2 – To enable learning, innovation and personal growth in the local community by providing communal spaces and equipment for art, design, repair, engineering and entrepreneurship. 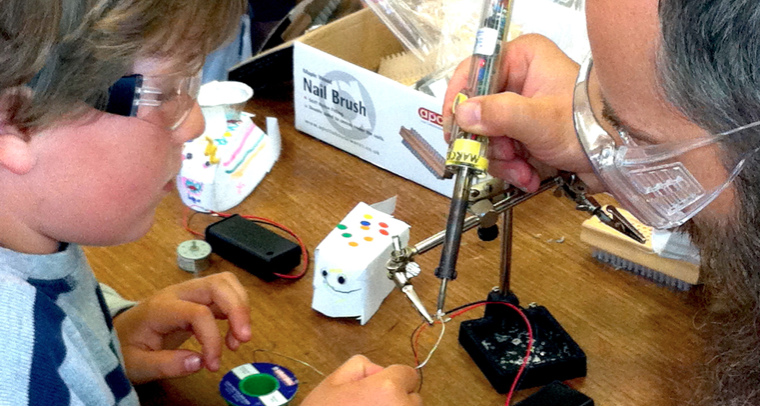 A makerspace is founded on the community and we need you to join us. To enable learning, innovation and personal growth in the local community by providing communal spaces and equipment for art, design, repair, engineering and entrepreneurship. At the Thrive2020 conference of Mon 10 Oct 2016, Patrick Abrahams spoke about the Men’s Sheds initiative which has over 350 sheds in the UK, 900+ in Australia and more beyond. It overlaps hugely with what we’re planning for Makerspace Guernsey so his talk has given us renewed vigour to get a venue sorted out and get going. Thank you Patrick! After quite an epic hiatus, Maker School returns with some workshops for the holidays! Disassemble. Destroy. Dismantle. Discover! Taking things apart is a GREAT way to learn what goes on in the devices we use every day. In a guided and thoughtful way we’ll be breaking the seal on a range of gear and harvesting the parts for future use. Expect motors, LEDs, circuit boards and more. Building Marcel’s cool vibrating robots from scratch. We’ll be using motors that were harvested on Monday plus batteries and nailbrushes then soldering and hot gluing them into action!Alert: This will be fun. Come and play with a ton of LEGO and be challenged to do the impossible! Expect head-scratching, brick-smashing frustration and jubilant success! As some of you already know, the Digital Greenhouse is kindly letting us use their facility as a base for operations as they prepare to open our first full-time community workshop. We’re extremely grateful for the support and encouragement from DG and we’re looking forward to more collaborations going forward. To celebrate, we’re intending to host a series of open events in the new Digital Greenhouse facility. The first event will be held over the week of half-term, Monday 22nd to Friday 26th February. 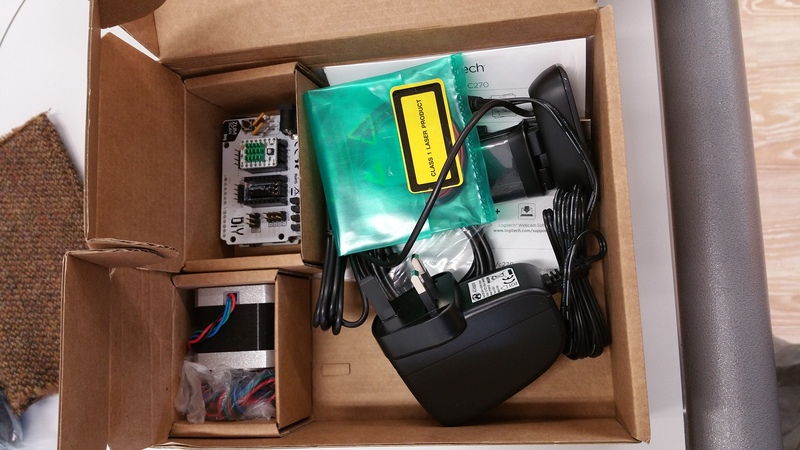 Over the course of the week we will be attempting to build an open source BQ Ciclop 3D scanner, using BQs electronics package and parts printed on the Ultimaker. The scanner will then become permanent Makerspace equipment. If you have any ideas for other build projects for future events please tell us. It’s an open event, all week. Come along and chat, help out, bring along stuff you’re working on. 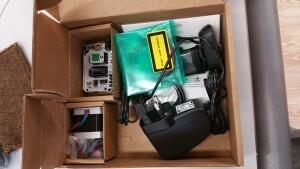 BQ Electronics kit for the Ciclop comes with a purpose built Arduino compatible control board, motor drivers, laser line modules, webcam and power supply. Does the seller take off VAT? What is the extra shipping cost to Guernsey? PrintME 3D were great on both these fronts. They took off the VAT automatically on the website and the shipping to Guernsey was only £20, which is incredible considering the size and weight of the printer. Not only that but I placed the order on Sunday 26th April, PrintMe 3D dispatched it the next day and TNT delivered it to me two days later, on the Wednesday. That’s pretty good turn around for a big parcel in my books. On the 20th March we held an open meeting for anyone that has an interest in the development of a makerspace in Guernsey. 20 people signed up to the event and 13 people attended the meeting along with myself , Sasha Kazantseva and Marcel Lenormand. The mission of the meeting was to engage the local community into building the local Makerspace and Maker Movement. 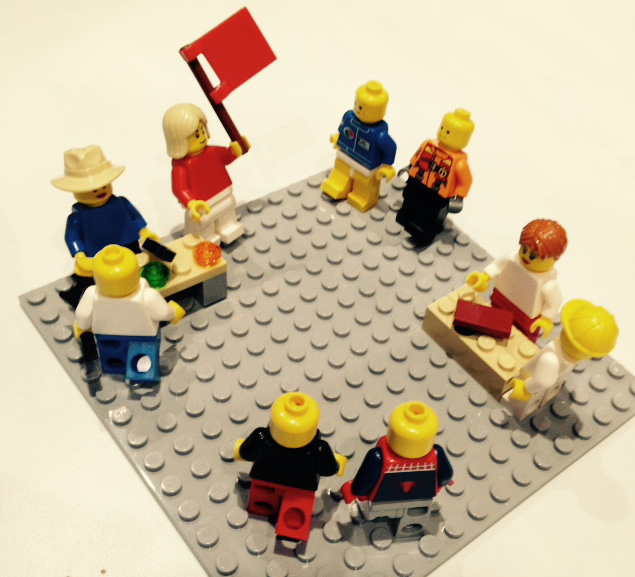 True to Maker principles we decided to conduct the brainstorm through LEGO Play. We previously had a very successful Lego Play Lunch and thought it would be perfect to replicate this amazing visual facilitation tool. It was fascinating to watch the faces of the people arriving and walking into a room with a large table in the middle covered in LEGO! What happened next was was really quite interesting. With LEGO Play there a no firms rules on how you should work, only that we gave them 12 minutes to come up with something that would represent their answer to our question. Some people immediately got stuck in and started building, whilst other instead started talking with those sat next to them for a few minutes before even touching the LEGO. Most people worked on their own models but a few people worked together on a shared model. Once the build time was over, each person presented their model and explained their answer to the questions and how the model represented that. In keeping with the no fixed rules for the LEGO Play, there was no fixed order for presenting which led to a natural progression of ideas where the previous person had an idea that related to their own. It soon became apparent that there were two main themes in the responses. Firstly, the majority of people wanted a physical space that they could go to that had tools and equipment that they could use to create things and store projects in progress. This isn’t really a surprise as this has been the intended goal for the makerspace from day 1. However, the second theme, that seemed to come across more strongly than the need for a space, was a need to facilitate connections between makers on Guernsey. From talking to lots of people about the makerspace, I know that the island is crammed with creative people. The trouble is that many of them are being creative at home, in their own sheds, garages and spare rooms. There is a wealth of knowledge out there and many want to share that knowledge but don’t know how to let people know, or those that want to access the knowledge don’t know how to find the help they’re looking for. This second aspect of a makerspace, connecting people, is something that we can do now without having a physical location for the makerspace. Creating connections can be done online, through our website and so that’s exactly what we’re going to be doing. Join our mailing list to be kept informed of upcoming gatherings etc. A subsequent announcement has also been made that the two groups; Beer Code Design and Nerd Nights plan to merge — bringing together two wonderfully diverse creative crowds that will form the nascent makerspace community. The idea for a maker-space in Guernsey has been building for some time. Inspired by five months of travels around North America on his motorbike, Adrian Ritchie came back to Guernsey with the idea of setting up a community space for makers, bike enthusiasts and creative people. Person by person he has been inspiring and getting others involved. 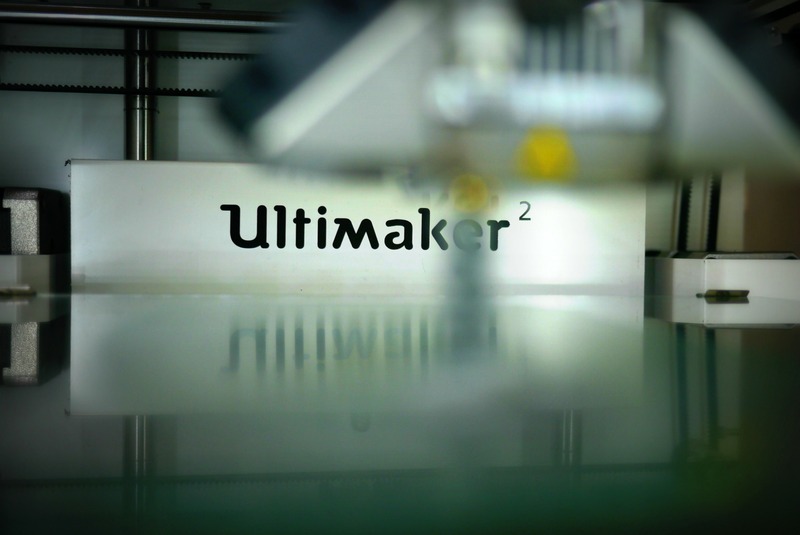 The vision for the maker-space is to create an innovation hub, merging hardware and software to enable the Maker Movement revolution in Guernsey. The mission is to create a diverse maker community that will help Guernsey become a player in the 3rd Industrial Revolution. Sounds like a great plan but how do we go about it? I’ve seen 3D printed prosthetic limbs for humans before but prosthetics for a dog is a new one on me. When you think of home 3D printers what do you imagine being made? I’m guessing it’s almost certainly a small plastic item which is printed in one go. I’m also guessing that a life-size model of a motorcycle wouldn’t enter your mind. But that’s exactly what Jonathon Brand creating with his open-source Unimake 3D Printer. As an avid motorcyclist I find this absolutely stunning, the level of detail and the translucent appearance. Donate now to help us provide cool tools and equipment!